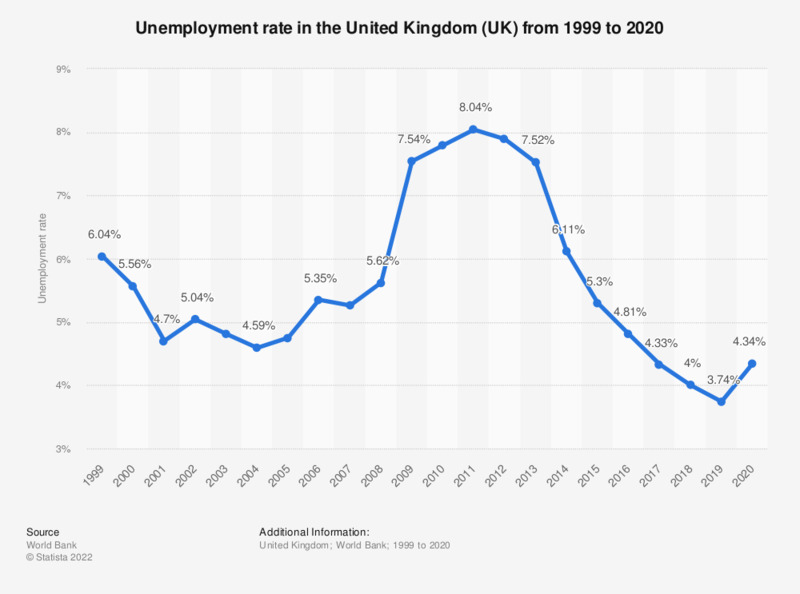 The statistic shows the unemployment rate in the United Kingdom from 2007 to 2017. The UK's unemployment rate decreased to 4.33 percent in 2017. The global financial crisis of 2008 left many nations with high inflation and increasing unemployment rates. The United Kingdom, however, has attempted and successfully lowered the unemployment rate since 2009. The UK is a member of the Commonwealth of Nations, the Council of Europe, the G7, the G8, the G20, NATO, and World Trade Organization. It is therefore one of the biggest and most important economic powers in the world. It consists of England, Scotland, Wales and Northern Ireland, and in 2014, the UK population amounted to over 64 million people. The same year, it reported the sixth largest gross domestic product in the world, reaching more than 2.8 billion U.S. dollars - and with a prospering economy, its GDP is on the upswing: It is estimated that the GDP in the United Kingdom will grow by approximately 3 percent in 2015 in comparison to the previous year. Regarding unemployment, the UK has never been "typically European". Europe's unemployment rate has been relatively high in comparison to other world regions; the unemployment rate in developed countries and the European Union in 2014 was around 7.8 percent. Meanwhile, the global unemployment rate in 2014 was an estimated 5.9 percent. Despite reporting the third highest unemployment rate in major industrial and emerging countries, behind France and India, the unemployment rate in the United Kingdom is much lower than the European Union rate. Which region in the United Kingdom (UK) do you see as the most attractive to establish operations?